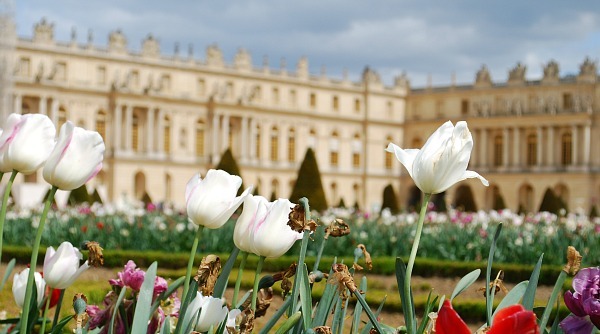 About 20km from the centre of Paris, you’ll find one of the most magnificent palaces in Europe in splendid condition. 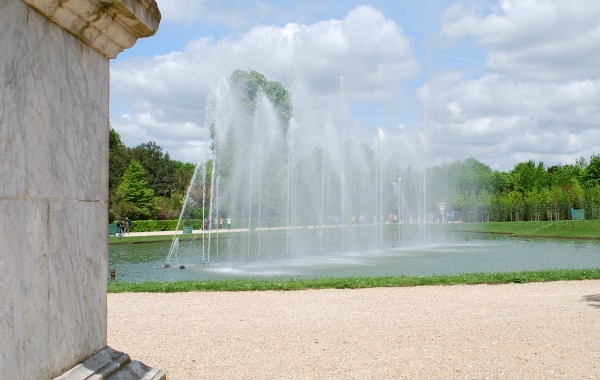 There are two main areas to explore, the palace itself (Château de Versailles) and the huge gardens, packed with water features. The palace was home to the royal family in France from 1682 until the start of the French Revolution in 1789 and inside it has all the luxuries you’d expect. 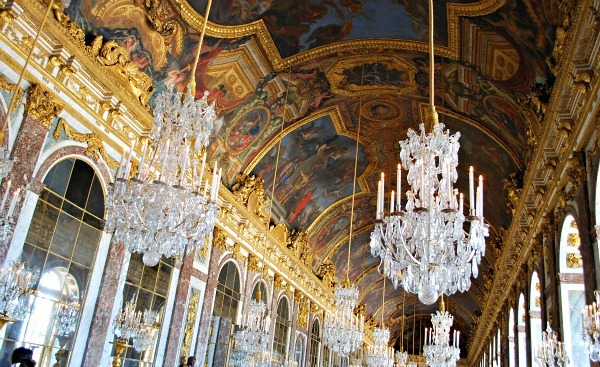 The palace has its own chapel and opera house, but for us it was the ‘Hall of Mirrors’ which really had the wow factor. This gallery style room looks out over the gardens and has matching mirrors that stand opposite every window. The chandeliers and painted ceilings help to make the room even more striking. In the gardens, the water features all ‘perform’ at different times, but there are lots of other features to enjoy too like the beautiful statues and a mini colonnade. This is an extract from our free Paris City Guide. The first thing you see when you’ve passed through security at the Palace of Versailles is on open courtyard, which gets the sun for most of the day. It’s tempting to just head straight for the main palace entrance, but we think you’re best doing a couple of other things before that. First, just stand in the courtyard, with your back to the golden gates and look up. This part of the palace is particularly pretty with stone and red brick in harmony and beautiful windows. You’ll also see the most incredible gold features all around the top of the building. This is the first evidence of just how luxurious the palace is and some parts of the inside are even more impressive. Next, head to the Mesdame and Dauphin apartments and have a look around there. Many people save these until after their visit to the main palace, but they’re not quite as large and not quite so luxurious, so they are much more likely to impress you if you visit them first. When you finally enter the main palace, you’ll be handed an audioguide which is included in your entry cost. This will guide you through the house starting with the chapel which has two levels, one for the Royal Family and one for everyone else. For us, the audioguide was too focussed on the artworks and who designed what room rather than the people who lived in the palace and what palace life was like, but it was interesting none the less. We also felt it went on a bit, and we were ready to leave each room, before the audioguide had finished. The rooms though are incredible to see. Apart from the highlights already mentioned, look out for the King’s bedroom which has absolutely everything covered in gold. Apparently he used to practically live in the room, even welcoming guests and taking his meals in there! Outside, the palace gardens are huge! They’re known for the water features which perform to music, but what we found is that there’s a point for several hours in the afternoon where the water features don’t do anything apart from the one that runs all day. This was somewhat disappointing as had we known this, we’d have gone in the garden before the house. So, if you want to get the best out of your trip, head the the gardens first. Most of the fountains are in action at some point from 11am to noon, so that’s a good time to be there. There are two other notable places within the parkland to see too, the Grand Trianon Palace and Marie Antoinette’s estate which includes the Petit Trianon and the Hamlet, which is a replica of a stereotypical French village with its own Mill and cottages. 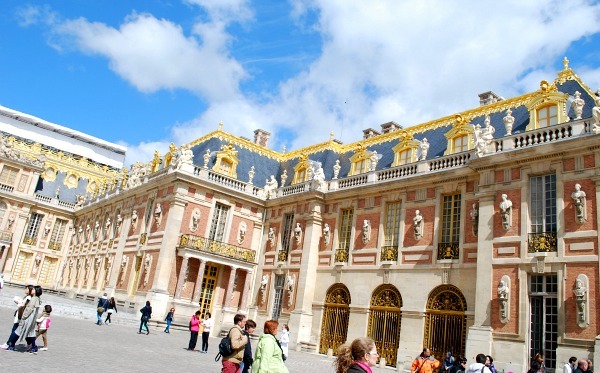 A road train from the main Palace of Versailles site will take you to these places. Going in the gardens first will also help you tackle the long queues that can form to enter the palace. On busy days, from about 10am to 3pm, a long line of people snakes it’s way across the plaza in front of the palace as people wait to go through security. Although the line moves fairly quickly, we found ourselves stuck in it for around an hour. We’d recommend buying your tickets in advance as this will avoid joining the separate line for tickets which doesn’t move so quickly. You can do this through the official website, but there are plenty of other options, some of which include transport. See the full list with prices in US Dollars here, or UK Pounds here. The Palace of Versailles is open every day except Monday from 9am to 6.30pm in the summer months and 9am to 5.30pm in the winter months. A range of ticket options is available depending on what you want to see. Adult tickets for the palace only cost 15 Euros (2013 prices) , but admission is free for under 18s and those under 26 from the EU. If you already have tickets, or you qualify for free admission, go straight to the line for the palace entrance. The gardens are open from 8am each day, and a garden only adult tickets costs 8 Euros (2013 prices). 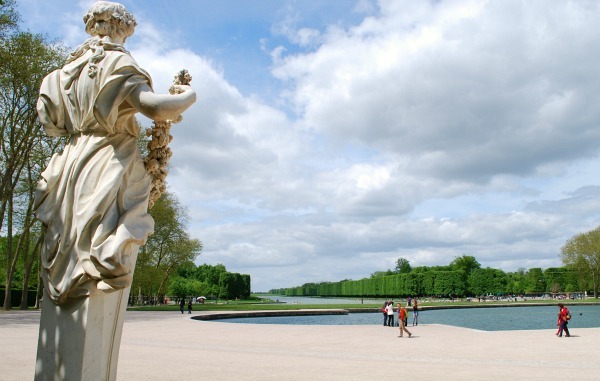 Getting to the Palace of Versailles from Paris is simple. You can go into most metro and RER stations and buy a return ticket on RER Line C which terminates at Versailles. The automatic machines have an English option, but if you’re buying multiple tickets it’s probably simpler just to ask at the ticket office. There’s a good chance that the member of staff will speak English, but if not when you mention “Chateau du Versailles” they’ll understand. The current single fare is only just over 4 Euros.